Slip this Easter Bunny Bandana over your doggy or kitty cat's collar for the Easter Holiday. The main center front fabric displays and Easter Bunny surrounded by colorful Easter Eggs. (All bandanas will be slightly different in design depending upon where the fabric pattern lays out when the fabric is cut.) The top casing and reverse side display a gradual faded yellow dotted background. The bandana includes a bow tie or ribbon bow in the corner. A ribbon bow and bow tie are shown in the images with this bandana. You are given the option of either a bow tie or ribbon bow in the options when ordering. A decorative bunny button sits within the center. (Ribbon bows will vary in design depending on stock availability). You will also be given an option to include an embroidered name within the center for an additional cost. The bandana slips easily over the collar and can be removed as quickly as it goes on. The bandana comes in XXS, XS, S, M, L, and XL and includes either a bow or a ribbon bow tie as shown in the images. I will also need to know if you would like the bow tie or the bow with your purchase. Bandanas can be custom made in any size and will fit collar widths up to 1 inch. If your dogs collar is larger than 1 inch, please let me know via email so that I can make the casing larger. 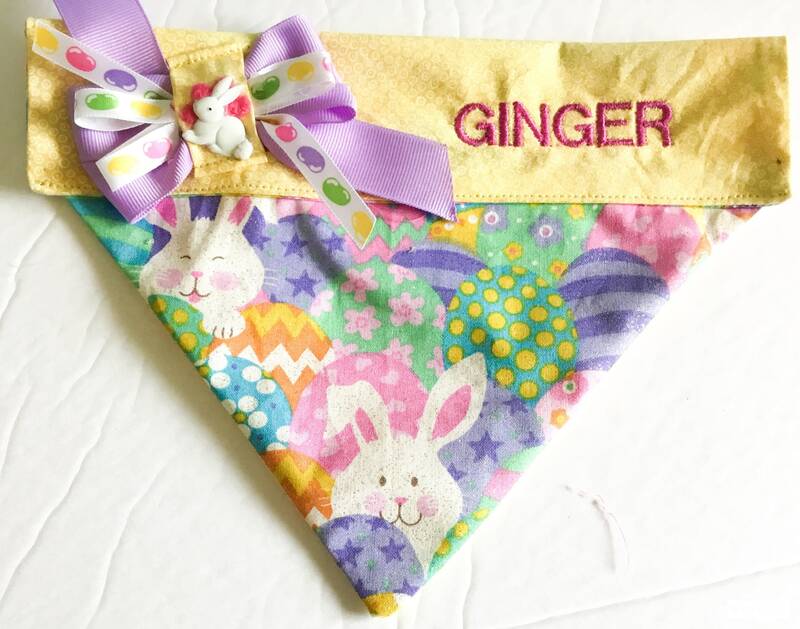 Love the 2 Easter Bunny bandanas that Terri from KVSPetAccessories made for our pupsters! Terri’s pet products are always so seasonally fun and creative. Terri responds to questions quickly and is always willing to work with her customers for special requests. I’ve purchased from her multiple times and highly recommend KVSPetAccessories! It came as advertised with my dog's name embroidered.